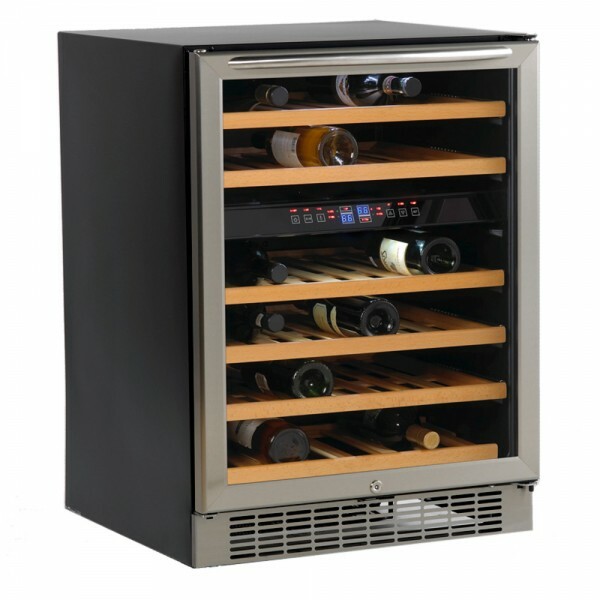 Avanti 46 Bottle Dual Zone (P/N WCR5450DZ). It stores up to 16 bottles in the upper zone and up to 30 bottles in the lower zone. Each zone has its own separate temperature controls. The 46-Bottle Dual Zone Mini Cellar can be built-in directly to your kitchen or bar or are perfect for free standing use. Each mini-cellar features an LED digital temperature display with an adjustable thermostat, tempered double glass doors, security lock and interior light. Includes matte black case with stainless steel door frame and pull. Proudly exhibit your personal wine collection in our new 46-Bottle Dual Zone Built-In Mini-Cellar.